With just about any aquarium, powerheads and circulation pumps are required equipment. But how do you choose the best ones? There are lots of choices out there, and there seems to be a lot of conflicting advice, depending upon the agenda of the person giving it. That’s why we have decided to give it to you straight, and help you choose the best aquarium powerhead or circulation pump for your fish tank. Where is the Best Placement for a Powerhead? Best Placement for Planted Tanks? Next, we’re going to take a look at some of the specific pumps that are out there. All of these are great pumps, but they may not fit everyone’s needs. We will cover each one in detail and try to help you choose the perfect pump. 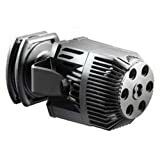 However, we’ll start with the most popular out of all of them, and then cover the most versatile one, followed by some other great choices among powerheads. First up is the Voyager 4 Power Stream pump from Sicce. This is a best seller and highly rated, and will work with just about any tank. It pushes 1200 gallons per hour and the price is reasonable for as good as it is. The reason that this pump is one of the most popular is simple: It does a really amazing job and will work in just about any aquarium you put it in. This is sort of the budget option among Voyager pumps, but it still outshines most of the pumps out there. If you need something stronger than this (and few people will) you can choose another Voyager model, which push anywhere from 2800 to 4000 gallons per hour. This is one of the most innovative pumps out there, allowing for installation on the back glass of the tank. It can also be turned in almost any direction you can think of. This is a circulation pump and not only is this one of the most affordable ones on the market; it is the most versatile ones on the list. You can choose from the smallest aquarium pump from this brand to the largest one available if needed. A nano powerhead or circulation pump can work really well if you have a small tank. This pump is terrific because you can choose between several different sizes, this means that it doesn’t matter if you are looking for the largest or the smallest aquarium pump, you can depend on Hydor. They take up a tiny amount of space, making it the perfect nano powerhead for your nano aquarium and what’s great is you can choose from a variety of power; 600 GPH, 850 GPH, 1150 GPH or 1500 GPH, all an affordable price. With strong, suction cup installation you can place this pump anywhere and it is versatile enough for freshwater, saltwater reef aquariums of any shape or size. Plus, it is designed to work with advanced features like wavemakers and timers. 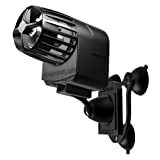 When Maxspect introduced the first model from this series of powerheads it became the first gyre-producing water moving machine designed for aquariums in the world. 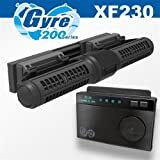 When we compare this model with standard powerheads we will notice that Maxspect Gyre XF-230 Kit, which includes an aquarium pump and controller, provides much better water movement. It is primarily focused on generating wide horizontal water movement that doesn’t leave any dead spots behind. This powerhead has two directional water flow cages, original flow system, advanced controller and great design. While this is not nearly as versatile or powerful as the first two on the list, this powerhead pump does have some advantages over the others on this list. It is also listed at a really great price. Let’s take a closer look. The 50 Powerhead from AquaClear is a really consistent pump that features a total of 270 GPH. It is perfect for smaller aquariums and fish that don’t need much filtration. 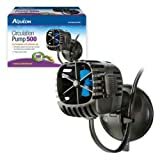 This is a terrific pump for filters that work underneath gravel, helping to move and aerate the aquarium water and supporting a variety of filters. In addition, this pump can be used to increase the oxygen level of the water if you add more fish. This pump will also help to treat disease if your fish get sick and it has been rated extremely high in all areas including safety, design and innovation. This is a compact, but energy-efficient pump. When it comes to pump brands, there are a lot of choices out there, but one of the best on the market is the Turbelle brand, trusted and used by many aquarium owners for many years. Let’s check out some of the Turbelle pumps. Turbelle has a huge assortment of pumps for all budgets and all uses. You can find an extremely wide and varied list of features on each of the pumps that they offer, and you will have to decide what you need for your pump. The prices are also quite varied, because of the sheer selection that is offered by Turbelle. Unfortunately, you will have to look at each individual pump to decide if it has the features that you want, and if it is within the budget that you have set for your aquarium. But the bottom line here is, these are extremely high-quality pumps that will all do a great job with the aquariums that they are compatible with. This is a budget pump, but don’t let that fool you into think that this pump will not do the job you need it to. It is actually pretty powerful for such a low price. Let’s take a look at this Aqueon pump. There are six different sizes that you can choose from when it comes to these Aqueon pumps. But the nice thing is, even though the increase in GPS is actually pretty significant, the amount of power that you will use to run these pumps is not. The selection starts with the 2.6-watt pump that pushes 600 gallons per hour through your aquarium and then increases to 700. After that, the selection goes 950, 1250 and 1650, with the final wattage at just 8.3 watts. Plus, this pump is scientifically designed to mimic the motion of river and reef currents, so it works no matter what kind of fish tank you have. Easy to remove and clean – literally takes seconds! 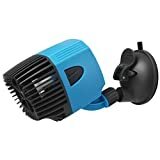 This is one of the most affordable pumps on this list, but it still has a lot of great features that you will find useful. Let’s get into the review of this KEDSUM submersible pump. There is so much to love about this KEDSUM pump. First of all, if you’re looking to create waves in your aquarium, or if you have fish that do better in moving water, this pump already does the job. Plus, this is a huge pump that pushes a ton of water through your aquarium, making it appropriate for any size that you can think of. In fact, this pump can push a whopping 2642 gallons of water through each hour, giving your fish an opportunity to exercise and feel as if they are in a real river or ocean. Plus, it promotes the spread of food when feeding and healthy microorganisms, it also promotes the growth of your fish. Rio Pumps have been around for a while now, and have earned quite the reputation for quality and performance. We’re going to review some of the Rio pumps that are out there and see what is available. 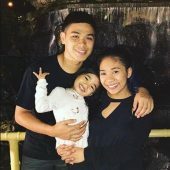 Since there are so many Rio pumps out there, it is impossible to review a specific pump. They are just all really great pumps and which one you choose will depend upon what you need the pump for. There are Rio pumps that come in every possible price range and ones that have the features that you want. But since there are so many, you will have to do your own research and pick the ones that you want. However, no matter which you choose, you can trust in the quality and reliability, knowing that it is a Rio product. Now, let’s check out the pros and cons. This Marineland pump is one of the most highly-rated aquarium pumps on the market right now, and it is really easy to see why. We’ll go over the advantages and disadvantages of this pump for your own aquarium. Let’s jump right into the product review for this pump. This is from Marineland, another one of the most respected brand names of aquarium pumps available right now, and this is one of their better models. There are three sizes to choose from among the Penguin Submersibles, and they all run really quiet, which is quite surprising because of how powerful they are and how much water they move. The three sizes that are available include the 145 Gallons-per-Hour, the 170 GPH and the 300 GPH. Now, let’s take a look at the pros and cons of this unit, so that you can decide whether or not it is perfect for your home or office aquarium. Have you thought about getting a Maxi-Jet pro aquarium pump for your fish? If so, you aren’t alone. Maxi-Jet is from Marineland, one of the top brand names on the market right now, and this is one of the best products that they have put out. Let’s take a look at the product itself. The last pump on our list also comes from Marineland. 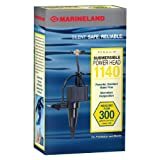 This powerhead works underneath gravel, makes waves that are compatible with timer programs, and makes some of the most realistic simulations of lakes and oceans available right now. This pump is adaptable to just about any purpose you can think of, and it is actually several pumps in one – the regular powerhead pump, the utility pump and the circulatory pump, which works best when you have a sump pump attached to your display pump. In this second, we’re going to take a look at the best placement for a powerhead-style as well as circulation-style pump. We will discuss the best placement for the pumps that are out there, depending upon what kind of fish tank you have, and how much room you are working with, as well as what kind of a design you are going for. We will cover everything to do with the placement of a powerhead or circulation pump for all kinds of tanks. Powerheads can keep your fish healthy, but they are also important for the health of other items in your tank, such as plants and even aquatic rocks. If you are using a fish tank filter, keep in mind that the filter is only going to work on the side of the tank where it is placed. That’s why a powerhead is recommended if you want to keep your tank healthy and clean. In general, you want to place the tank so that it starts at the back and pumps water to the front of the glass. However, this is only the case with standard tanks. There are other types of tanks out there that may require a bit of a different setup. We’re going to cover them now, so that you will know exactly how you should be setting up your aquarium. The first type of tank that we’re going to discuss when it comes to placement is the planted tank. A planted tank is any tank where you have plants growing. Usually, these plants are designed to mimic the bottom of the lake or ocean where the fish you are keeping are found. However, you can put many different kinds of plants in your tank and still make your fish happy. So, there are a lot of options when it comes to planted tanks. However, there are also a lot of options when it comes to choosing the location for the pump in planted tanks, because the location will depend upon what kind of setup you have. For example, if you have gravel lining your tank, you may have a hard time growing plants, and you may have to work harder to aerate those plants properly. So, what you want to do is ensure that you are able to oxygenate the entire tank, and if you have too many plants that your fish and are getting sick, then you may want to remove some of them. Next, let’s discuss saltwater reef tanks. What you have to understand, first of all, is that reef tanks are set up so that they will mimic the natural world as closely as possible; even closer than the previously discussed planted tanks. Planted tanks have a little bit more creative freedom in comparison with planted tanks, since they can be decorated whichever way you choose, as long as the plants still get oxygen. Reef tanks, especially saltwater tanks, on the other hand, are a little more challenging, since you need to find out how much oxygen these plants and fish normally get, and then set up your pump accordingly. Let’s talk about wavemakers for a moment. We have already discussed wavemakers to a certain extent. If you have plants or fish that are used to seeing a current, then you want to mimic that with a pump that causes waves. There are several good pumps on this list that already do that, but if you do not find one you like, then you can always add a third-party wavemaker system that will get the correct amount of resistance and oxygen to the plants and animals that are in your aquarium.